One of my favorite spots in Toronto during the summer is the Toronto Music Gardens, a short distance from the Harbourfront Centre on Queens Quay, just before Spadina. 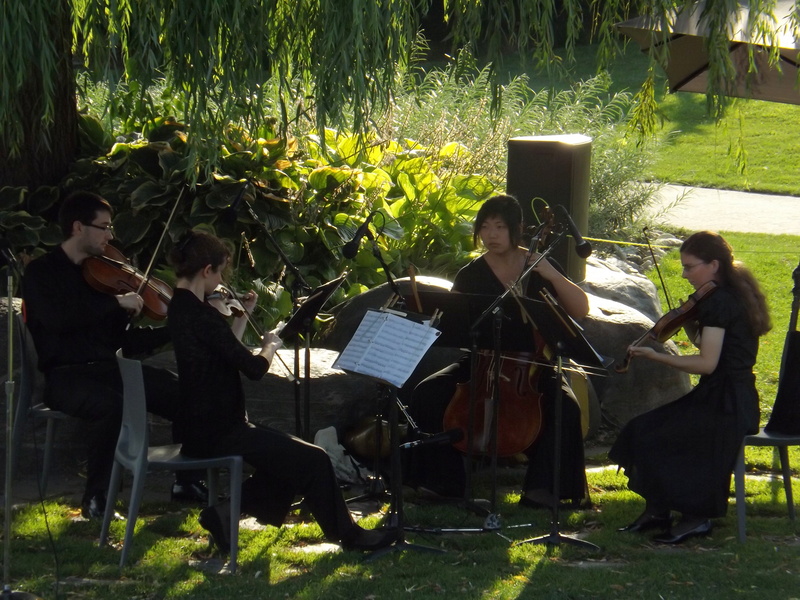 Every summer, the garden hosts Summer Music in the Garden, a series of open air, free concerts on Thursdays and Sunday. One of the most memorable concerts was at the end of August, when members of New York’s Gretchen’s Muse ensemble performed Egalité: the String Quartet Edition. They were joined by internationally renowned cellist Beiliang Zhu for a performance of Haydn’s String Quartet in C Major, Op. 50 No. 2, and Mozart’s String Quartet in F Major, K. 590. Despite the constant noise from the construction along Queens Quay, I thoroughly enjoyed the concert, and the music garden itself. It is designed in a way that interprets in nature Bach’s First Suite for Unaccompanied cello. You start of with the curves and bends of the riverscape, and then make your way through six sections of the garden, ending at the impressive Giant Grass Steps. These form a bow-shaped, curved amphitheater where the performances take place during the summer. The yachts and the harbour behind the performers provides the perfect background. What a perfect way to end a beautiful summer in Toronto 2013! To read more about the Toronto Music Gardens, visit Landscape Voice here. Cultural Events, Events, Live concerts, People, Places, Summer, Where art thou?